I have to admit it, I'm a little obsessed with pouch top crafts! When the kids were younger, we went through applesauce and baby food like crazy, many with those little tops. The tops are colorful, bright, and perfect for all kinds of manipulatives. If you have some red or blue pouch tops handy, they'd be perfect for this last minute 4th of July craft. FYI, affiliate links are included in this post for your convenience. So many kids' foods come in these pouches nowadays. So we'd end up with a ton of the tops on our hands after the kids had breezed through their applesauce and baby food. We like recycling things into toys and manipulatives, so of course that's where my mind went. It started with our Bug Buddies. These have been played with so much at our house and they all have names and personalities all their own now. There are just a ridiculous number of things you can do with these little guys and I'm not the first to try to use them in new ways. Pinterest is full of great ideas. I also put together a list of the top 10 things to make with pouch tops, if you need even more ideas. These pictures are from the Comet Wand that I made, but the process is the same. These milkshake straws that I'm using are from the seasonal aisle at Mariano's. They're thicker than normal drinking straws but you could also try extra thick pencils, dowel rods or maybe tinker toys? Please leave any other suggestions in the comments! Stack 10-15 of the cellophane shreds in a stack with the ends lined up. Splay them apart a little bit like a fan and fold them over the top of the straw at the point where they are all still stacked. Test to see that your straw fits. You may need to wiggle it or pinch it lightly. If it still doesn't fit remove some of the cellophane (you could always tie more on the cap once you're done). If you’re going to hot glue them, take the straw and cellophane back out keeping the cellophane folded over the straw, pour some hot glue into the cap while it is sitting with the screw hole facing up. Carefully insert the cellophane-covered straw into the cap, watching that your fingers don’t come into contact with the hot glue. Let it dry and there you go! 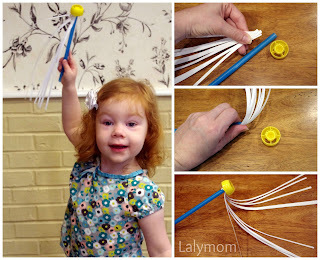 Let me know if you try making our fireworks wand! 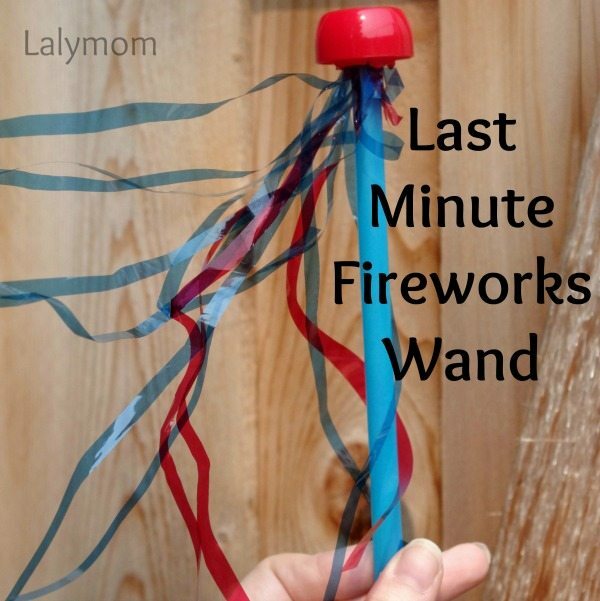 Do you and the kids have a favorite 4th of July craft? Be sure to share it in the comments. Happy 4th of July! Aw this is so cute! 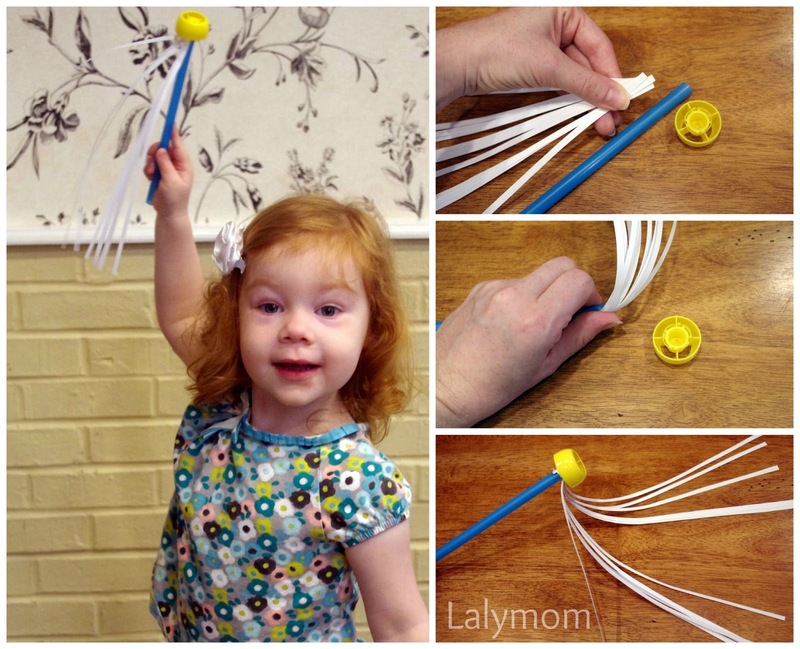 She looks like an expert wand-waver! That is so so cute! What a great way to upcycle something too. Great festive craft for little ones! My daughter will love this! Congrats on the guest post! I hope you can check out my 4th of July rice shaker tutorial @ http://www.RocksNoSaltMommy.com. Have a great holiday!